3 BEDROOM; 3.5 BATHS; WALK TO POOL; FREE PASS TO BEACH; MINUTES FROM EVERYTHING! Leave your stress and worries behind as you completely unwind and relax in the air-conditioned comfort of this 1700 sq. foot home that will indulge your family or Golf Group! This is the Home Away From Home that you were looking for! Immaculate, Restful, Inviting, and Safe..Our Coldstream Cove townhome will exceed your expectations of a dream vacation! We realize how many vacation rental homes are out there, and we are humbled to be considered as a choice for your stay. We listen to every Guest and we make sure that your decision is rewarded with a home that outshines any other consideration. State of the Art KEYLESS Entry Lock System enhances SECURITY features by eliminating traditional need for keys-EVERY GUEST WILL HAVE THEIR OWN UNIQUE CODE that is destroyed after vacating! Please keep reading to discover the level of care we provide to our valued Guests! This larger town home boasts THREE MASTER SUITES as a full bath is in two and another just outside of the third bedroom! Why spend your hard-earned money on a single, expensive hotel room when you can relax in an entire house nestled in a tranquil neighborhood and experience, first-hand, Southern living along the Grand Strand? There is, quite simply, no better financial option for your vacation! Trouble with steps? No problem! Everything you could possibly need (to include 1.5 baths) is on the Main Level! The King Master (ground floor) has an on-suite full bath, complete with two sinks and a jetted Garden bathtub.Luxurious bedding, overhead fans, and a walk in closet complete this spa experience! Upstairs Guests will find two more exquisite Queen bedrooms, one with its own attached full Bath, for convenience and total privacy. Professionally decorated, traditional Southern overhead fans further indulge sleeping comfort. The loft area is magnificent and has two plush recliners that face one of the four flat screen televisions in the home. Designed as a private comfort zone, this is THE perfect spot for peace and quiet, for watching your own sporting event, or for taking a nap! There is another full bath on this second floor level. The kitchen is a dream; fully equipped and prepared to handle your culinary needs. Dishwasher, microwave, garbage disposal, toaster, Keurig and traditional coffeemakers are but a few of the amenities you will discover within. Generous supply of plates, glassware, utensils are available. The lanai, or screened in porch, is an outdoor living space that is protected from the elements allowing Guests to enjoy nature at its best as you relax in perfect harmony with the natural woods that border the property. Listen and observe nature as you sit on the cozy outdoor furniture. Cook outside this area on the concrete slab provided for the Infra-Red Grillmaster gas grill. This area, alone, seals the deal for our Guests who have told us that this is their favorite spot in the house. There is now beautiful outdoor seating, as well, to further enhance this tranquil environment. The beauty and grace of this home extends to the dining area and the living room. Wood floors add cool comfort, both areas are designed with your comfort in mind, and they live up to that promise! Functional AND comfortable, this is the perfect place for that gathering for conversation, planning, memories and sharing. There is a SMART television in the living room with a DVD player. Time-Warner Cable provides our cable and wireless connection-there is never a complaint about slow connectivity for those who bring work or just need to get on-line. We have a full laundry center with a new, extra large capacity, washer and dryer and we provide detergent and fabric softener. Never a need to pack extra clothes and no need to lug home dirty laundry at the end of your vacation. How easy is that? Every piece of luxurious bedding gets switched out to keep our home fresh and immaculate and up to the high standard we demand to keep our Guests satisfied. Window treatments were added for a more welcoming, homey touch, and Carolina blinds were just installed throughout in 2016 adding beauty and functionality. We installed a whole house filtration system with the most advanced induct air purifier for the removal of airborne contaminants of pathogens and/or harmful molds, insuring that the air quality in our home is constantly at its best! The air conditioning unit is always kept in top condition and is backed by a 24 hour service in the event of any technical issues. We promise to ALWAYS listen to our Guests and to make our home as welcoming as we possibly can! There is so much to see and do in Murrells Inlet, Myrtle Beach, and the surrounding historic areas. Every member of your family or group will find the perfect spots for them! We INCLUDE A FREE PASS TO HUNTINGTON STATE PARK BEACH as an amenity to our Guests as a way to say thank-you for choosing our home. This pass saves a considerable amount of money for our Guests and can be used for the entire duration of your stay. Guests are permitted to use the Community Pool at Coldstream Cove- this is within walking distance from our unit and is one of the nicest pools in the area! Our unit is professionally landscaped and protected by Pest Control experts. Our home in Coldstream Cove IS the perfect spot for your vacation. I forgot to mention that we are right across the street from the TPC Golf Course; our front door view looks out at the Driving Range! You will not want to leave and I promise that this place will beckon you back every year! After 10 week long stays, the 11th stay is on us! THAT’S how much we value our Guests! FOR OUR ACTIVE DUTY SERVICE MEMBERS - we are honored to offer ONE FREE DAY off the total cost of your weekly rental. WE THANK-YOU for your commitment to our beautiful USA, and we extend a warm welcome to you! Your dedication to service is something we honor every day! Affordable, safe, family-fun..what more could you ask for?? We really do look forward to having you as our Guests and to sharing our home with you! Ben is an Associate Athletic Director for the United States Military Academy at West Point, NY and I am a Guest Service Rep for the Holiday Inn in Fort Montgomery, NY in Orange County. 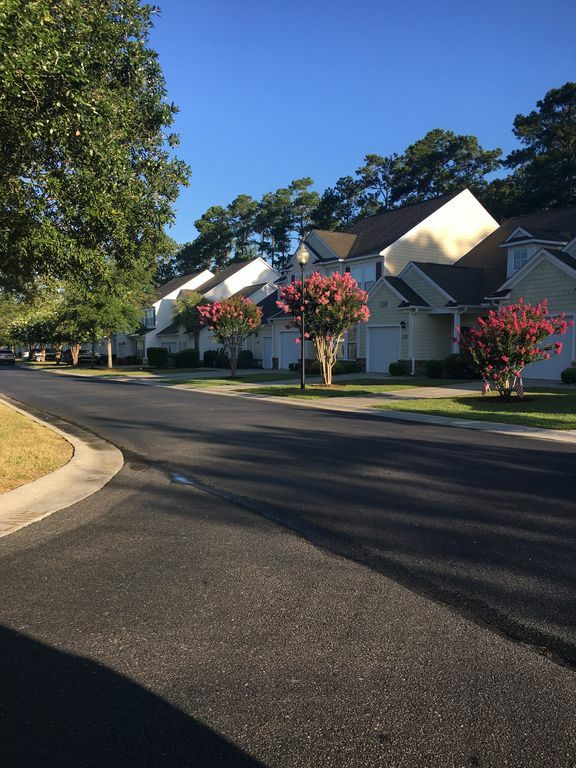 We absolutely love sharing our Coldstream Cove home in beautiful Murrells Inlet, SC, and we want families to have an affordable alternative for their hard earned vacations! We work really hard to be a responsive, friendly vacation home owners and we value each and every one of our Guests and their opinions and suggestions. We want you pampered, relaxed, and ready to return to the low country for your annual vacations! We simply fell in love with the area, and while we live in NY, South Carolina offered a southern charm that we couldn't resist! It is hard to describe the feeling when you walk through the front door..it is immaculate; inviting and just plain luxurious. You put your suitcases down and your vacation begins. It beckons you in every way, in any weather. There is so much to do OR there is nothing to do. The best of both worlds. Truly a getaway experience! Bath Towels, washcloths, sheets, blankets, comforters, pillows Linens should not leave the unit! Could not ask for a better location when TPC Myrtle Beach is the course you want tp play. The unit was very clean. The furnishings were well above what you normally expect to have in a vacation rental. The linens were top quality. Mary pays attention to lots of little details that make her unit the one you should consider first for your next golf vacation. We booked Coldstream Cove for my in-laws the week of Sept. 8th-15th and due to hurricane Irma, my in-laws had to change the dates. Mary worked with us and was able to accommodate the change. Mary was wonderful to work with, my in-laws said it was the clean, convenient to the beach, shopping and more. The pool was a step away and the beach right around the corner. They will be back next year! If you want a place to stay that is just far enough away to be out of all the hustle and bustle but close enough to the beach to be there in a few minutes this is the place for you. It comes with a Huntington Beach state park pass and you are within walking distance of the pool. You can enjoy a marsh walk and see the alligators as well as swim with ease as there is life guards on duty. By the way the park pass gets you into the Myrtle Beach state park as well and there is a pier there. The owner was amazing to work with and made sure we had everything we needed for our stay. We will definitely stay here again. Thanks Mary. Thank you so much for this review! We were so honored to have you and appreciate the great care you gave our home!! We know how many choices there are for your vacation rental home and we work really hard to make sure that every Guest has everything they could hope for at our home. We can't wait to have you return when you next visit the Murrells Inlet/Myrtle Beach area!! Thank you!!! This is the 4th stay with Mary and Ben since 2010. The townhouse is clean, well appointed and comfortable. We will be back for the next two years for our annual trek to the SC. Grand Strand. Great property & Wonderful Hosts = Return Trip! This was our first trip to South Carolina so I spent a great deal of time researching options for where to stay. I am so happy that we chose this townhouse because it was everything described online and more! It is very clean and well stocked with everything you need. Mary was great to work with from the time we made our reservation. We can't wait to return and will book this property! It is a beautiful townhouse, quiet, steps to the pool and close to everything - beaches, stores, restaurants- without being in the middle of the craziness. The condo exceeded our expectations. The location is great and the closeness to the TPC was as described. We were able to enjoy lunch (she crab soup excellent) on many afternoons. The property was immaculate and very well equipped. Mary was a very gracious hostess and was quick to respond to all our inquiries. I highly recommend this rental and assure all will get full value for your vacation. Great meals at the Dead Dog Saloon. Ask for Nikki and tell her that her tall friend said hello. Visit the state park with the pass in the condo also take a day trip to Hopsewee Plantation just a short distance (10 to 15 miles) south of Georgetown. Bring a bottle of wine and enjoy the best lunch in South Carolina. Free Pass to Huntington State Park Beach will be provided to our Guests as an ammenity. This amazing beach is lifeguarded, has a covered picnic area, and nature trails. A must-see/visit if you love the ocean! Unlimited use during your stay!